Atlanta's Women's March for Social Justice ~ Fun Food Life! 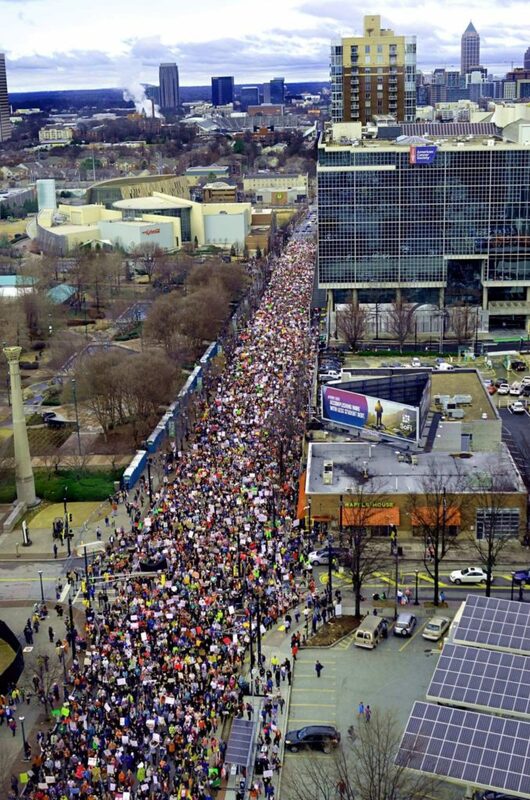 Here’s an impressive picture that was taken of the March for Social Justice & Women in Atlanta yesterday. (I didn’t take the picture…I was one of the pink dots in the picture). I got home too late last night to watch the evening news but my husband watched the news and told me the count was at around 60,000 marchers in Atlanta! The organizers had estimated about 10,000 marchers and yesterday morning we all woke up to pouring rain, thunder & lightening. I did not rethink my decision to go, but I hoped that the rain would not prevent others from showing up. When took the subway to town, and when I exited the train at the CNN station I was elated to see the crowds of people that were in the station…As I emerged from the station, it was exciting to see the large crowds that were gathering up on the street level….And the rain stopped ! The subway stop was several blocks from the starting point and as I walked the crowds who were walking beside me just got bigger and bigger. It was like I was floating along in a river with branches and tributaries dumping more and more marchers into it…. It was hard to get a sense of the numbers of sisters & brothers who showed up to march, but I knew it was a lot. Every where I looked I saw crowds of people. When I approached the park where all the crowds were gathering I was at a higher elevation and I could look down and see a large body of people. It was amazing! Today as I read about the march in Atlanta, DC, Chicago, Los Angeles, Seattle, and across the nation and across the globe I am humbled, joyous, elated, encouraged, and energized. And now the real work begins….